We hope you enjoyed your last stop in the Grand Canyon. What’s that? Still in the mood to see some great natural wonders? Perfect, so are we! Pile in, folks. We’re headed north to the very first national park in the world. As Naturalist John Muir described it back in the 1880s, prepare to see “Nature at work as a chemist”. We’re stopping in to admire bison, steam clouds of sulfur, and the world’s greatest geyser collection at Yellowstone National Park! With more active geo-thermal features than the rest of the world, Yellowstone is wild and alive. Sure, you’ve heard of the famous Old Faithful. But altogether there are actually more than 10,000 thermal features at Yellowstone, including geysers, hot springs, mudpots, and fumaroles. 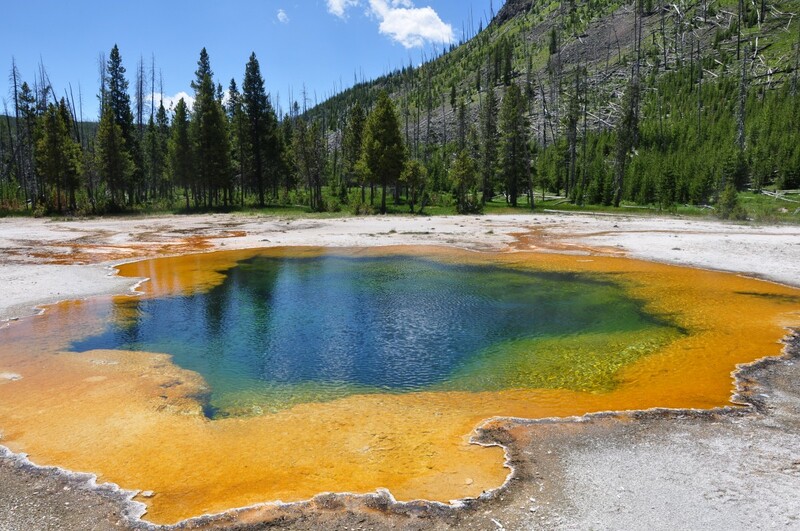 Here, you’ll experience a rainbow of vivid color as water flows from hot springs, starting with yellow, then orange and green. The unique activity in the park provides geologists with a glimpse into what goes on thousands of miles beneath the Earth’s surface. In all its bubbling and erupting wonder, Yellowstone has been regarded as a sacred place by the groups of people who have lived near it throughout time. In fact, it’s believed that early Native American visitors to Yellowstone left offerings at thermal features to show their respect. Interested in seeing the work of the oldest living things in the world? Check out Mud Volcano at Yellowstone. Its single-celled organisms are so old and different from the bacteria covering Earth’s surface today that they are classified into their own kingdom, the Archaea. Amazingly, they create mudpots by metabolizing sulfur and water into rock-dissolving sulfuric acid. Alright, that’s enough science for us too. Make the most of your adventure at this historic and wondrous site. Yellowstone National Park Trip Planner offers a vast amount of information to plan a vacation to Yellowstone, including the top five road trips to the park, an overview of the five park entrances, a map, what to do if you only have 48 hours in the park, and a guide to lodging and camping in the park. The Yellowstone Official National Park Handbook from the Department of the Interior and the National Park Service will walk you through the history, geography and wildlife of the park. Loved Yellowstone so much you want a view of it every day? Bring the park home. The poster Greater Yellowstone depicts scenic park features and the large basin created by a massive volcanic eruption 600,000 years ago.